Long Purple Aubergine is one of the most commonly grown variety. Produces good quality, dark fruits. The calyx is green and can be very prickly. 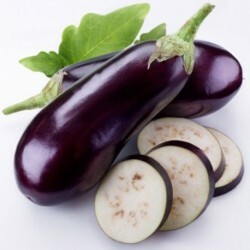 Aubergines are high in potassium, folates and magnesium and a good source of Vitamins E and K and pro Vitamin A. If you grow peppers with success you willnot have trouble with aubergines. For best production grow the aubergine seeds and plants under cover. Aubergines, whether you love or hate them, are a wonderful addition to any garden, even if just for it's beautiful flowering foliage. 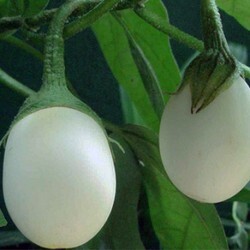 The aubergine plant can be quite particular to heat and season and it needs specific growing conditions to really fruit. A long, warm, growing season is ideal. Newer seed varieties are being developed that require less days to maturity so those with shorter seasons or colder climates can also grow this wonderful vegetable. If you live in one of these places, make sure you choose seed that has the shortest growing season. The aubergine plant is bushy and branches out with woody, thick stems. At their full maturity, they are 1-8 feet tall, depending on the variety. The flowers are star-shaped and purple. They often grow as solitary blooms or in clusters of two or more. Many people grow this plant in their flower gardens as an ornament. 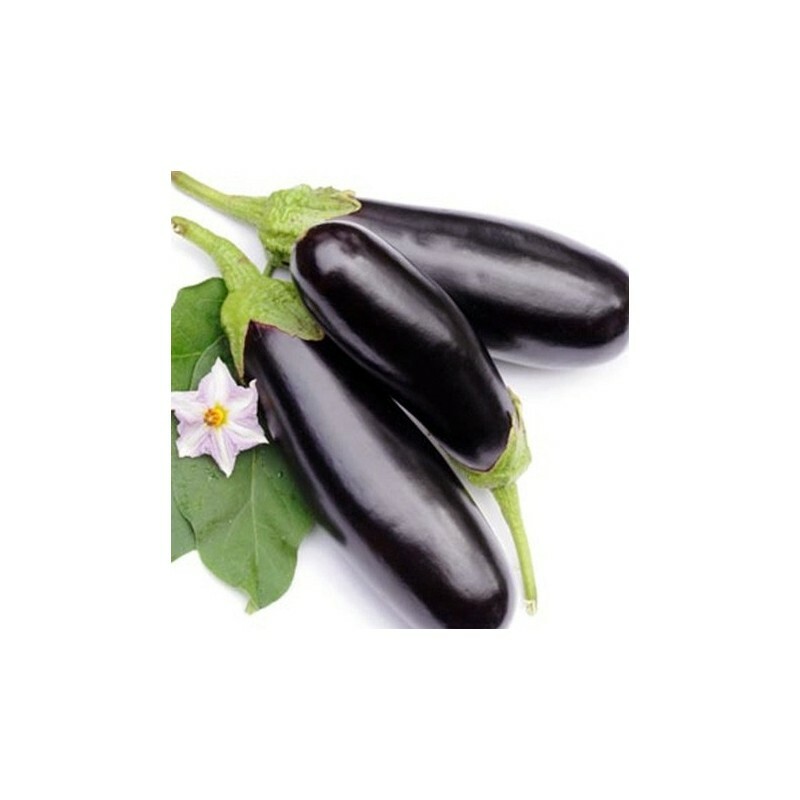 Aubergines come in a variety of shapes and sizes, ranging from deep purple and pear shaped, to long, slender Asian varieties that are white and don't require any peeling. The most common are the purple ones however the other varieties are gaining traction and garnering more interest with home gardeners across the country. The soil temperature needed for these seeds to germinate is 15-35C, however the ideal is 26-32C. They will not germinate at all in cool soil. However, if the temperatures get too hot, above 32C, that is also a problem. The plant may stop growing fruit and shed it's flowers. Ideal daytime temperatures for aubergines are a consistent 21-29C for the entirety of the plants long growing season. Because of these particulars, to be the most successful in growing aubergines, it is recommended to start them indoors, 6-8 weeks prior to ideal outside planting weather. Fill seed pots or containers with rich soil and plant seeds 1/4-1/2 inch deep. Even indoors, it is important to keep the soil warm so the seeds can germinate. Seedlings will need 12-14 hours of bright light, preferably sunlight. The soil should be kept moist but not drenched. Seedlings should be planted in full sun in well-drained, rich soil after there is no possibility of frost. Transplant the seedlings 18-24” from each other in rows about 35 inches apart. If the seedlings are outgrowing their starter pots and the soil is still to cool to plant them outdoors, re-pot them into larger containers. Putting them out too early will surely kill them. Plants need to be watered deeply and regularly to prevent fruit drop. They can tolerate short dry spells once they are matured, however without regular watering the production will suffer. Depending on the expected height of the aubergine variety you are growing, staking the plants may be a good idea. Tie the plants to the stake as they grow. The most common and serious disease that affects aubergines is verticillum wilt. This is common with nightshade plants, which includes tomatoes, peppers, and strawberries. All the nightshade plants can pass this disease one to the other. The best way to avoid it is to plant your aubergine in a spot that you have never planted these other nightshades. Alternately, planting in containers also works well. A common pest is aphids, which generally can be dealt with by spraying them with water, washing them off the leaves. When they reach a third of their anticipated size, aubergines become edible and can be harvested. The smaller, tender, fruit is preferred by most. Fruit should be bright, smooth, shiny and firm to the touch. The fruit is ripe when a thumb pressed lightly into the flesh bounces back slightly. If the indentation stays, the fruit is past maturity. Any that are dull looking, wrinkled, or soft are over-ripe. These aren't good to be eaten because they will be bitter and full of tough seeds. To remove the fruit from the plant, use pruning shears or a knife to cut the tough, thick stem. Regularly harvesting the fruit when it becomes edible encourages the plant to grow more and keep up a consistent production. Aubergines do not store well at all and should be used as soon as, or very soon after, being picked. Room temperature storage is best. Refrigeration can cause the fruit to soften, grow brown spots and deteriorate.